In August, 1944, that the idea of “Natter” (German for Viper) was conceived and four designers, Heinkel, Junkers, Messerschmitt and Bachem, were directed to submit plans. Diplomeur Ingenieur Erich Bachem who made his first appearance with his submission of the BP(Bachem Projekt) 20 Natter (Adder). The BP-20 was envisioned as a small lightweight expendable interceptor, capable of destroying any enemy bomber using the least possible weapon expenditure. Dr. Bachem’s design was chosen and in November of that year Natter BP-20 was flown for the first time. Smaller than the Me-163 (span, 13 feet; length, 20 feet, 6 inches) and simpler to build (wooden airframe required only 600 man hours) it looks more like a mock-up than a full-fledged fighter. Because of the short take-off area required it was well suited to close defense of vital targets and pilots required very little training. Launched from a nearly vertical ramp, powered by a Walter rocket unit similar to that used in the Me-163, the initial rate of climb was calculated at 37,000 feet per minute, its top speed at more than 600 miles per hour. A controlled missile until within a mile of its target, the pilot then takes over, jettisons the nose cone exposing 24 Fohn 7.3 caliber rockets which are fired in one salvo. Protected by exceptionally heavy cockpit armor and presenting a small head-on target, the pilot is virtually invulnerable to enemy fire. His principal danger is in take-off and descent. Going into a dive after two minutes or less in the air he bails out and a section of the fuselage containing the rocket unit likewise descends by parachute. It was the first vertical-takeoff fighter ever built and certainly the first where the pilot was expected to bail out on every mission. That project had its origin in a proposal in 1939 by rocket engineer Dr. Werner von Braun. This proposal was rejected as unworkable by the Reichluftfahrtministerium (RLM-German Air Ministry) but found an enthusiastic supporter in Bachem who tried, and failed, to generate interest in several different proposals for a rocket interceptor along the lines suggested by von Braun. The airframe was comparatively crude, largely of wood construction and was to be built without the use of gluing presses or complex jigs. Most parts could be made in small woodworking shops through Germany, without interfering with the existing needs of the aircraft industry. According to Bachem, only 600 man-hours would be required for the production of one airframe, excluding the rocket motor, which was relatively simple to manufacture when compared to a sophisticated turbojet. This motor was the same basic engine used in the Me-163 Komet interceptor, a Walter 109-509A-1 that used the reaction between two chemicals, T-Stoff (a highly caustic solution of concentrated hydrogen peroxide and a stabilizer) and C-Stoff (a mixture of hydrazine hydrate, methanol alcohol, and water) to provide 3,740 lb (1,700 kg) of thrust. Extra power for lift-off was generated by four 1,102 lb-thrust solid-fuel rocket boosters bolted to the rear fuselage giving a combined thrust of 4,800 kgf (47 kN or 10,600 lbf) for 10 seconds. The short, untapered, stubby wings had no ailerons, lateral control being exercised by differential use of the elevators mounted on a cross-shaped tail augmented by guidel vanes positioned in the exhaust plume of the main rocket. 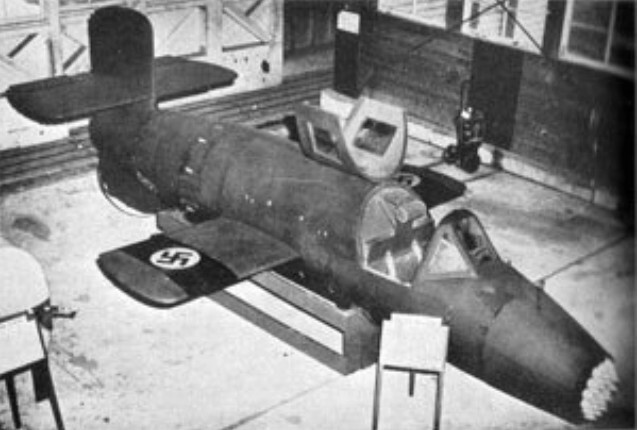 The cockpit was armored and armament consisted of 24 unguided Henschel Hs 217 Föhn 73 mm rockets mounted in tubes in the nose of the aircraft and covered by a nose cone. The cockpit was equipped with only basic instruments, the instrument panel actually serving as the pilot's frontal armour. The pilot was protected by armour on each side of the seat, and a rear armoured bulkhead at his back separated the cockpit from the fuel tanks, which contained 6gal of a hydrogen peroxide and oxyquinoline stabiliser solution and 41.8gal of 30 per cent hydrazine hydrate solution in methanol. In operation, the Natter would be launched from a 79 ft (24 meter) tower. Guide rails would stabilize the wingtips and lower tailfin until the tower was cleared. (Towards the end of the war, as steel became scarce, the tower was replaced with a simple 29 ft [9 meter] wooden pole with a pair of shortened launch rails bolted to it. There was the need for a solid concrete foundation into which the gantry could be secured, though the wood pole version could be quickly dismantled and removed from a mounting set into such a base.) Controls would be locked during launch. About 10 seconds after launch, the solid-fuel boosters would burn out and be detached by explosive bolts and the controls would become operational. The aircraft’s autopilot would be controlled from the ground by radio; the pilot could assume manual control at any time. The Natter would accelerate upward with a proposed climb rate of 37, 400 ft (11,563 meters) per minute until it reached the altitude of the Allied bomber formations which could range from 20,000 ft to 30,000 ft (6,250 meters to 9,375 meters) . The pilot would then take control of the Natter, steer it in close, jettison the nose cone, and fire all 24 of the rockets simultaneously at the bomber. The rocket fuel would be exhausted by now and the pilot was to glide downward to about 4,500 ft(1,400 meters). He would then release his seat harness and fire a ring of explosive bolts to blow off the entire nose section. A parachute would simultaneously deploy from the rear fuselage and the sudden deceleration literally throw the pilot from his seat. The pilot would activate his own parachute after waiting a safe interval to clear the bits of falling Natter. Ground crews recovered the Walter motor to use again but the airframe was now scrap. It was also envisioned that the Natter could be used on the remaining surface fleet with an air defense capability previously denied to ships. Bachem now pulled strings to get his proposal accepted. The strings that he pulled belonged to Reichsführer Heinrich Himmler, head of the Shutzstaffel (SS-Protective Staff). Himmler saw the possibility of establishing a fleet of aircraft beyond the control of the Luftwaffe and the RLM and signed an order for 150 of Bachem’s machines using SS funds. Alarmed, the RLM now approved Bachem’s design and placed their own order for 50 of the aircraft under the designation Ba-349 Natter (Adder). With orders from both the Luftwaffe and the SS Führungshauptamt (Planning Office), Bachem set up a factory to design and build his dream at Waldsee in the Schwarzwald (Black Forest) about 25 miles (40 km) from the Bodensee (Lake Constance). Wind-tunnel models which were built early in the program were shipped off for testing and the only results returned to the Bachem designers were that it would be satisfactory up to speeds of about 685 mph (1,102 km/h). An initial series of 50 Natters was built within three months of the launching of the project, and unpowered gliding trials began in November 1944. The first successful pilotless launch was accomplished on December 22, 1944, with a dummy in the cockpit. A Heinkel He-111 bomber carried one to 18,000 ft (549 meters) and released it. The pilot found the aircraft easy to control. At 3,200 ft (1000 meters), he fired the explosive bolts and the escape sequence worked as designed. A powered vertical launch failed on December 18 because of faulty ground equipment design. On December 22, the aircraft made its first successful launch with the solid fuel boosters only because the Walter motor was not ready. Ten more successful launches followed during the next several months. Early in 1945, the Walter engine arrived and the Natter launched successfully with a complete propulsion system on February 25, 1945, carrying a dummy pilot. The launch proved that the complete flight profile was workable. All went according to plan, including recovery of the pilot dummy and Walter rocket motor. Although Bachem wanted to conduct more pilot-less tests, he was ordered to begin full-power piloted trials immediately. On February 28, 1945, a volunteer, Oberleutnant Lothar Siebert, attempted the first manned, full-power Natter launch. However, the cockpit canopy detached itself at an altitude of 1,650 ft because of improper locking. Siebert was knocked unconscious as the Natter continued to climb to 4,800ft before nosing down and crashing, with fatal consequences. More pilots volunteered to fly and the Bachem team launched three flights in March. Manned flights continued, seven of them, but only 36 of the 200 Natters ordered were completed. Altogether 25 Natters actually flew, though only seven of the flights were piloted, in April 1945 ten Natters were set up at Kirchheim near Stuttgart to await a chance to intercept Allied bombers. However, Allied tanks arrived at the launching site before the bombers appeared, and the Natters were destroyed on their ramps to prevent their capture. French tanks advanced into Waldsee on April 1945 and a great number of spare parts from the Bachem factory were captured. Only a few days before the French arrived, fifteen rocket engines destined for Nattern had been thrown into Lake Waldsee to prevent their capture. The secret was not well kept however and all were later recovered. A B-model Natter, with revised armament and an auxiliary cruise chamber in the engine to increase powered endurance from 2.23min to 4.36min, was in the works at the end of the war. Three Ba 349Bs were built before VE-Day, but only one was test flown. Only two authentic Nattern survive. One is at the Deutsches Museum in München (Munich), restored in the colors and markings of one of the unmanned test aircraft. The Smithsonian Institution’s National Air and Space Museum in Washington DC has the other Natter which was captured by U. S. forces at the war's end and shipped it to Freeman Field, Indiana, for analysis. The captured equipment number T2-1 was assigned to the Natter and the US Air Force transferred it to the National Air Museum (now NASM) on May 1, 1949. Powerplant: one 1700-kg (3,748-1b) thrust Walter 109-509A-2 liquid-fuel rocket motor (of 70 sec power duration) and four 1200-kg (2,646-lb) thrust Schmidding 109-533 solid-fuel jettisonable booster rockets (of 10 sec power duration). Initial ROC: 11140 m (36,550 ft)/min. Radius of action: 40 km (24.8 miles). Launch Weight: 2200 kg (4,850 lb). 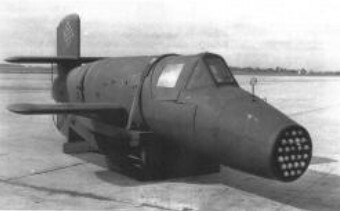 Armament: 24 Fohn 7.3-cm (2.87-in) unguided rocket projectiles in nose. Engine: One 4,409 lb (2,000 kg) st Walter HWK 509C-1 bi-fuel rocket motor, plus (for take off) four 1,102 lb(500kg) or two 2 205 lb (1,000 kg) Solid-fuel rockets. Wing span: 13 ft 1.5 in (4.00m). Length: 19 ft 9in (6.02 m). Gross weight: 4,920 lb (2,232 kg). Max endurance: approx 4 min. Initial ROC: over 37,000 ft (11,280 m)/min. Max speed: 620 mph (1000 kph) at 16,400 ft (5,000 m).